The Science of Bee-keeping is known as Apiculture. It involves the maintenance of bee colonies in manmade hives. Keeping bees has potential benefits for man and the environment. As a result of their pollination service, they are essential to all human for food production and sustenance of plants. However, due to the low production technology being employed, developing nations seem to have the lowest yield per colony when compared with other developed nations. For instance the average yield per colony in the US is about 35kg, while in Africa, it is about 23kg. Two species are domesticated and used in beekeeping. First is Apis cerena in South East Asia and secondly Apis mellifera worldwide. Beekeeping as a nontimber forest enterprise dates back to the 18th century (about 300 years ago), but its potential as a means of livelihood has not been fully explored. This piece highlights the benefits of beekeeping and the multiple goods that could be derived from the enterprise. Bee-keeping has potential to enhance income of households, particularly in rural areas. 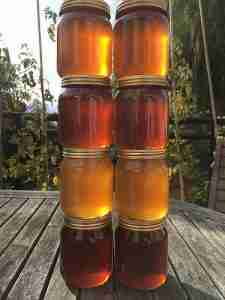 Honey as one of the produce from bee keeping is a mixture of different compounds including sugars mainly fructose and glucose, carbohydrates, water, vitamins and minerals. It has religious significance, as the Hebrew Bible contains many references to honey. For instance, the book of Exodus famously described the Promised Land as a land flowing with milk and honey. Honey bees live in a caste system comprising one queen bee, a fertile female; a few thousand drone bees, or fertile males; and tens of thousands of female worker bees. Honey is produced by the worker bees mainly from the nectar of flower or honey dew on leaves and bark of trees. This produce is widely consumed all over the word because of its high nutritional profile. It could be taken as medicine also, either alone or in combination with other herbs. A list of ailments treatable by honey includes common cold, cough, gastric ulcer, restlessness, hypertension, infected surgical wounds, burns and sores and eye itching. The recently estimated annual honey production by the United Nation’s Food and Agricultural Organization was over 2000 tones, yet most developing nations’ production appear to be insignificant as they were not recognized by the publishing agency. Secondly, bee-keeping can be integrated into many agroforestry systems, and are traditionally an important part of small scale integrated farming systems. They do well in natural forests and on integrated farms with abundant water and flowers. Beekeeping provides an excellent service for farmers by crop pollination as honey bees are the main pollinator for most plants, hence a good surrogate measure for plant productivity. On a third note, the bee wax is used in the manufacturing of cosmetic, candles, foundation sheet (for houses), as a water proof agent for wood and leather, ointments, soaps, polishes, battery cells, transformers, clothes and polishes. It is also used by dentists as an artificial denture. Fourthly, its propolis has some therapeutic and antibiotic usage, and therefore it has a high pharmaceutical value. The venom is useful for treatment of rheumatism, arthritis, nervous disorders, eye and skin diseases, while the royal jelly is used to cure infertility and dressing wounds. Bee-keeping does not require a large piece of land; one can start with as little as a quarter plot (1,250 ft2) At this scale, there is minute competition for land space with crops or livestock. 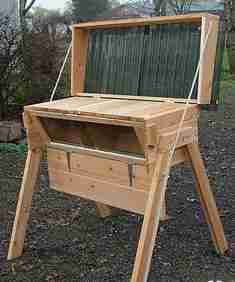 The enterprise needs relatively small investment capital and most of the equipment needed for both traditional and modern beekeeping can be sourced locally. Hence, starting the enterprise is not costly, the insects can produce their own food all year round, and availability of all necessary input locally can easily be initiated on limited level for employment and income generation; and it does not depend on importation of foreign inputs. More so, there are readily available markets for bee products both locally and abroad. The cost for setting up a hive is less than $50 (about ₦17,000), while the cost for maintaining it is about $100 (about ₦35,000) annually. Meanwhile the cost for renting a bee colony on a monthly basis for crop pollination is about $200/acre (about ₦70,000) and could cost more depending on the crop to be pollinated and the size of the farm. The price of honey in Nigeria for instance ranges from $274.2 to $329 (about ₦86,500 to about ₦115,150) per ton and this is way higher in other developed nations. In view of the foregoing, it is apparent that the viability of this enterprise is quite interesting, having a payback period of less than 2 months upon colonization of the hive and about a hundred percent return on investment. Bee products provide farmers with an additional source of income as both local and international markets are readily available. Beekeeping can be used as a means of poverty alleviation and job creation especially in the rural areas of countries where there is a high level of unemployment and the people are mostly engaged in subsistence agriculture for food production. The enterprise can be undertaken by anyone who has the ability and determination to look after bees properly and courage to work with bees. Working with bees requires a gentle touch and calm disposition. It also requires basic understanding of the honey bees’ behavior during the various seasons and during handling and moving. It is not gender bias as men, women, youths and the elderly can participate in enterprise within the homestead. Depending on the country and environmental factors, a typical colony of bees can produce 80-120 pounds of surplus honey and 10 pounds of pollen in a year. In conclusion, beekeeping is a profitable enterprise that generates income with less input. More so it is environmentally friendly as little or no waste is generated. Therefore, it is strongly recommended as a major and as an alternative source of income. Its products especially honey, is so much in use and consequently in demand that it can be termed a money spinner because it has the potential to reduce poverty and malnutrition. Plate 1: Sample of a Beehive.